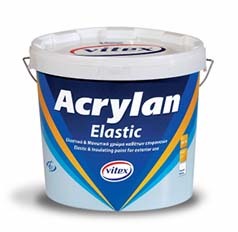 Elastomeric waterproofing paint with special 100% acrylic UV-crosslinkable resins. Top resistance to extreme weather conditions (high - low temperatures, strong rainfalls etc.). It completely covers small surface cracks and monitors contractions, retaining its elasticity while “breathing”. Colours: Available in white and an unlimited number shades through Vitex’s Colorfull Tinting System. 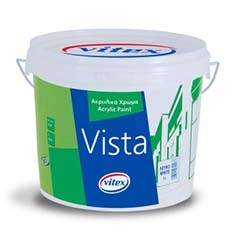 High quality acrylic paint, based on 100% acrylic resins, suitable for exterior use. It provides great hiding power, unrivaled spreading rate, superior whiteness and exceptional resistance to frequent washing and adverse weather conditions. It creates a smooth matt finish and ensures vapor permeability to surfaces. Silicone acrylate high quality product with excellent water vapor permeability, low water absorption and high durability. Ideal for areas with high humidity and extreme weather conditions. 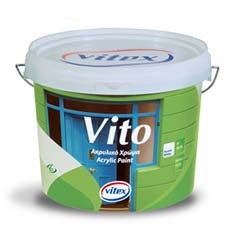 Acrylic paint for exterior use, with great hiding power and high spreading rate. Easy to apply with very good leveling properties producing a smooth, flat surface. 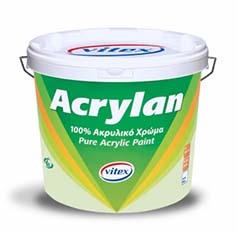 Acrylic paint for general use based on acrylic copolymer resins, with great hiding power and high spreading rate. Colours: Available in white and a wide range of shades through Vitex’s Colorfull Tinting System. Textured coating with great durability suitable for any outdoor or indoor surface. Colours: Available in white. More shades may be produced using Vitex’s basic colours. 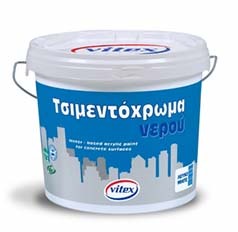 High quality water-based acrylic concrete paint, specially formulated for direct application on concrete, plaster, brick and other alkaline masonry surfaces. It provides great hiding power, high spreading rate and exceptional resistance to washing and adverse weather conditions. Available in four shades. 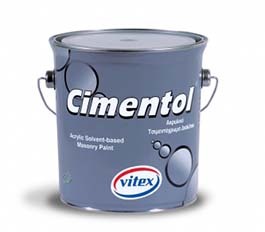 Solvent-based concrete paint Acrylic solvent-based concrete paint for outdoor, suitable for walls, concrete floors, tiles, garage, tennis courts etc. It offers great durability against adverse weather conditions and atmospheric pollution. Available in 8 shades. Colours: Available in white and 8 more shades. 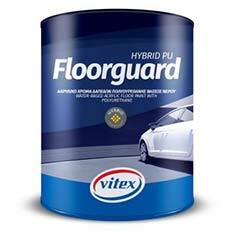 New technology 1-component, water-based, hybrid acrylic painwith polyurethane for interior and exterior floors with low-traffic use. Ideal for application on concrete, mineral or other floors (garages, pavements, warehouses etc). Due to its special composition, it has great resistance against wearing, chemicals, grease, detergents and exceptional durability to washing and adverse weather conditions. Itprovides strong adhesion, great hiding power and excellent levelling properties providing a fine satin finish. Colours: Available in white and thousands of shades through Vitex Coloring System.